Independent Book Store Day - Chicago Style! This Saturday, April 28, is Independent Bookstore Day! Independent Bookstore Day is a one-day national party that takes place at indie bookstores across the country! Every store is unique and independent, and every party is different. But in addition to authors, live music, cupcakes, scavenger hunts, kids events, art tables, readings, barbecues, contests, and other fun stuff, there are exclusive books and literary items that you can only get on that day. Here in Chicago, THE event is the Chicago Bookstore Crawl. Around 30 bookstores will be participating in the Crawl. It’s a great way to earn year-long discounts on books at the participating bookstores. To begin their trip, readers can pick up a My Chicago Bookstore Passport and their first stamp from the store of their choice with an initial purchase of $25 or more. Then, with each visit to another bookstore the reader will earn another stamp on their passport. Visiting 10 book shops during the day earns you 10% off your book purchases for the entire year. Visit 15 shops and you’ll get 15% off. (Discounts are limited to in print titles; shop’s with stock and trade in collectible and rare books will have exceptions to the discount policy). Abraham Lincoln Book Shop, Inc. is a great place to visit at the start, end or middle of your day. We are very close to three L lines; the Blue, Red and Brown lines are a quick walk. A couple of stops into the Loop on the Brown line and you’re at the Pink, Green and Orange lines. With at least three buses nearby too, the opportunities are almost endless. With little planning and CTA Day Pass ($10) you could easily visit at least 15 shops. Be sure to share your Chicago Independent Bookstore Day experience on Social Media. Use the hashtag #MyChicagoBookstore so everyone can find your post. Abraham Lincoln Book Shop will be hosting a Pop Up Shop for our Author’s Voice Network. Author’s Voice connects authors to the world via Live Streamed book programming. 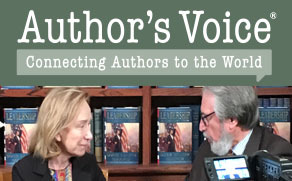 With a line-up of six programs, Author’s Voice gives readers the opportunity to meet their favorite authors, ask questions, and order a signed book. Viewers can watch at AuthorsVoice.net or on our Facebook page. You can watch encore presentations on your own schedule at out YouTube page. Many of the books featured on our shows-A House Divided, Berta’s Books, LadyBird & Friends, Lit With Love, Solved, Stranger Than Fiction-will be for sale. Most of the books for sale are signed by the author, too. With Author’s Voice, you can collect tomorrow’s classics, today! Learn more about Author’s Voice at AuthorsVoice.net. You can subscribe to our mailing list there too. Also, you can find us on Facebook, Twitter, Instagram and YouTube at AuthorsVoice. Stay in touch so you never miss a favorite author.